Wait. WHAT??? Did you just say, HEALTHY Peanut Butter Dark Chocolate Shortbread Bars?!? When we’re talkin’ peanut butter and chocolate, I don’t think anyone could go wrong there. Just because these bars were sticky and gooey, they were still mighty delicious! These bars did not have a shortbread crust because I was aiming to make a portable protein bar-ish thing. I was really surprised at how shortbread-like the shortbread base turned out! It was slightly crumbly and not too sweet, just like real shortbread cookies. But, the base turned out much thicker than I wanted… just as thick as the peanut butter filling! In the next trial, I’ll cut the shortbread base recipe in half. As for the peanut butter filling, I was imagining a soft, fudgy texture. Unfortunately, it was hard, dry, and crumbly. I think the dryness factor was because I used brown rice syrup, which is a lot thicker than honey. I’ll use honey in the next trial. And finally, the chocolate topping. It looked good, the texture was great, but the taste was awful. I used 100% cacao unsweetened chocolate mixed with 2 tbs of peanut butter and and 20 drops of stevia extract, and not even that could rid the bitterness of the chocolate! I’ll use 60% cacao chocolate in the next trial for a more pleasant taste. FINALLY! SUCCESS! Sweet, sweet SUCCESS! I don’t think the word “delicious” can even begin to describe these addicting bites! The “buttery” shortbread base, the soft and fudgy peanutty filling, the smooth chocolatey topping, mmmm. These taste far better than the previous trials — no dryness and certainly no bitterness. These Healthy Peanut Butter Dark Chocolate Shortbread Bars have the perfect balance of flavors with a healthy dose of nutrition inside! These no-bake Healthy Peanut Butter Dark Chocolate Shortbread Bars are so rich and decadent, it's hard to believe they're refined sugar free, gluten free, and high protein too! Line an 8x8" brownie pan with parchment paper both ways for easy removal later. In a large bowl, add all of the ingredients and mix together until everything is evenly incorporated. Scoop the mixture into the prepared pan and press to flatten. Refrigerate while you make the filling. Using the same bowl from the base mixture, add the peanut butter, agave, and stevia extract. Stir until smooth. Add the protein powder and stir again until everything is evenly incorporated. Scoop the mixture onto the shortbread base and flatten it out. Pour the melted chocolate over the peanut butter filling and rotate the pan around until the entire surface is coated in chocolate. Refrigerate until the chocolate has JUST hardened, then slice. Serve and enjoy! Store in a tightly sealed container in the fridge for up to ~1 week. You can slice these into 9 large bars, 16 regular-sized bars (like I did), or 36 bites, depending on what you prefer and how many people you’re serving. These are very rich treats, so I prefer to slice these into 16 or 36. They’re perfect for parties! 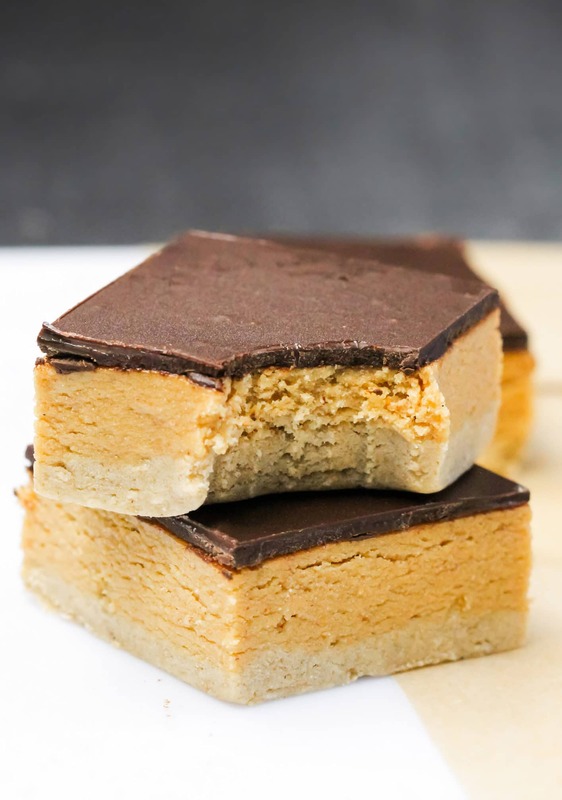 These Peanut Butter Dark Chocolate Shortbread Bars are best eaten close to room temp. Your teeth sink straight through the bar and you get all three flavors in one scrumptious bite! Mmmm… pure deliciousness. I am making these first thing tomorrow. YUM! Wow just found you b/c Emma/Sweettooth linked both of our recipes in her post and holy moly woman, these look amazing. I love all the trials and errors and your thoughts about what you did & changed & tweaked. I love the backstory on recipes. And the choc layer is SO SMOOTH. What tool do you use to spread it? My chocolate no matter what I do is NEVER that smooth! Ok yes very helpful! So you use regular chocolate that you melt, i.e Ghirardelli. I usually melt choc chips and I think the stabilizers in the choc chips render an un-smooth application. That or all the powdered sugar I add to the frosting/chocolate layer of most of my bars…haha! I melted the chocolate in a bowl at 30 second intervals until it was all shiny and smooth, then I just poured it over top of the peanut butter layer. I used a rubber spatula to push it out to the corners, but sometimes I just jiggle the pan until it spreads out itself. I guess it also depends on what chocolate you use (I used Ghirardelli). Hope this helped! Looks like an excellent recipe, I will try it out as soon as possible. I like the the scientific approach to the way the recipe was developed,together with peanut butter and choc-yum! If I were just using regular flour how much would I use (aka how much flour does one cup of rolled oats typically yield)??? I didn’t measure the oat flour, but I think it would amount to about 1/2 cup to a 3/4 cup. Try adding 1/2 cup of oat flour first, and if the dough is too sticky, add one more tablespoon at a time. Do you know what happens to whey protein when it is baked? Or exposed to heat for that matter? I’m experimenting with some existing dessert recipes and I know this one is no-bake, but I thought you might be the person to know. Protein powders can be baked into bread-like things. I guess you can say they act like a flour? It depends on what brand you use, but in my experience, the texture of an all-protein-powder baked good has never been great and the taste was always plain. That’s why I only use it as an additive to my baked goods rather than it being the sole source of “flour.” To see what I’m talking about, microwave one scoop of protein powder with 1/2-3/4 cup of milk (or nondairy milk) for about a minute, or just until it’s cooked all the way through. I did this in a mug, and I did not get a pleasant result. I hope you do, though! 3rd time is a charm right?! Looks pretty delicious to me! Do you have any calorie/protein information for these bars?! They look delicious!! As for calories, one bar will be around 492 calories if you make nine total. If you make the mini bites (cut each of the nine bars into quarters) it will be 123 calories per bite. As for protein, one bar (if you make nine) will have 21.1g protein (whoa! ), and one bite (if you make 36) will have 5.2g protein. Keep in mind that we may have different oats, or peanut butter and protein powder, so give or take on the cals and protein levels. Just to note, don’t be afraid of the calorie amount–although these bars are delicious, they are very rich and one bar is plenty (and not to mention filling from the healthy fats, fiber and protein!). Great, thanks for the info I can’t wait to try them! I really hit the jackpot finding this recipe! First of all – your photos made me want to make them right away! Great job on the photos! Your directions are superb and made my batch I made last week come out perfect! They are SO addicting, that’s the only down side! These look so wonderful. Who doesn’t like chocolate and peanut butter?? I can’t wait to try this recipe, but I do fear I will not stop eating them with just one…however – the protein level is good, so that makes me feel good about it. Hi, I noticed that you put protein powder in a lot of your recipes. why is that? and also, if I dont have it on hand, can I leave it out? I use protein powder in my dessert recipes because I try to make my desserts “nutritionally balanced” (with healthy fats, slow digesting carbs, fiber and protein) so they can be enjoyed as an everyday snack or meal, rather than a once in a while treat. As for omitting the protein powder, it really depends on the recipe, but in recipes like this I would strongly recommend keeping it in. The protein powder adds taste, texture and substance. Without it, it would just be goo. If you are looking for a protein powder, check out my pantry staples tab (at the top of the page under the header). I would recommend using whey protein powder, such as jay robb or optimum nutrition brand, as your first choice option. If you have allergies or dietary restrictions, then use Sun Warrior brand, just note that you may need to adjust the amount of honey you use. Have you ever tried baking with non-fat dried milk powder in place of the protein powder? do you think that would work? I’ve used dried milk powder in a few recipes of mine, but not as much as protein powder. I find that it has many of the same qualities when it comes to no-bake treats, such as these bars, but I haven’t had much luck using it in baked goods (it dissolves very fast and doesn’t provide structure like protein powder). I’m sp glad I found you! You must have posted this to Tropical Tradition’s recipe site because I first saw it there and LOVE it! I also make it using 1/2 almond butter and 1/2 coconut butter instead of PB. Yeah, I did post to TT’s site! And using almond butter and coconut butter sounds so good, I definitely need to try that 🙂 I’m glad you like the bars! These look so good that you have FINALLY motivated me to make my own protein bars. But one question: seems like lots of blogs refer to “one scoop of…” so casually that I wonder, are the scoops of Protein/workout powder products generally the same size and amount? I’m sorta excited to try this recipe. I can make my own chocolate product to put on top, right? (Coconut oil, cocoa, banana, dates, Stevia) This looks so good! The majority of protein powder scoops are the same size (~32g), however vegan protein powders tend to have smaller scoops (15g-21g). I included the weight (in grams) of the total scoops in the recipe in case people were unsure. I hope you love these protein bars, they don’t taste like protein bars at all! They are incredibly addicting, I have made the recipe over a dozen times and a few readers seemed to have liked it as well. Good luck! I’ve made these several times. Soooo delicious!!! Each time I’ve tweaked the recipe just a little. This last batch was the best. I added a little more coconut oil to the short bread crust and made it a little thicker by by multiplying the ingredients by 1-1/2. I baked the crust for 5 minutes at 400 degrees. The result was a fabulous crunchy shortbread crust. I doubled the middle layer ingredients to make a thicker and nuttier bar. To top it off I used 6 oz. of dark chocolate, a 1/4 cup of peanut butter, a smidge more stevia but the thing that really have it some zing was adding a 1/4 teaspoon of hazelnut extract to the topping. I’m sure I haven’t perfected it yet or perhaps to some I’ve ruined it but the fun is in making it a little different every time. Yay, I’m so glad you like the recipe! Good to know that the crust can be baked too, I definitely have to try that out. I just made these to give as a gift to a colleague. I struggled a bit being a nit-picky Stevia taster. I used monk fruit packets in the chocolate layer once I realized the the cocoa bar I had was 100 percent dark. Holy wowwy, was that bitter or what! Thank you for the great ideas – I am so excited to try your other goodies. I love you and your blog, Jessica! You are a food wizard! Each day I come back for a second helping of your blogs. I can tell you worked hard to make this happen BUT IT PAID OFF because everybody should LOVE your blog. This is so amazing — it is changing foodie LIVES!! I will get your cookbooks ASAP because I love your creations! You are beautiful and so is your food. THANK YOU for making a positive impact to the WORLD!! Bit by bit. Each piece of brilliance you have created (NUTELLA BAKING CHIPS = THE. BEST. IDEA.) looks so yummy and I am yet to try everything! Thank you thank you thank you!!!!!! Sooooooo, these look absolutely incredible!!! Love the luscious layers. I’m intrigued by the shortbread cookie base’s ingredients list, too. Hi! For the SHORTBREAD BASE, can I replace the oat flour with coconut flour? If so, do you know how much I would use? Also, can I omit the honey and use milk (or any other non-sugar liquid)? 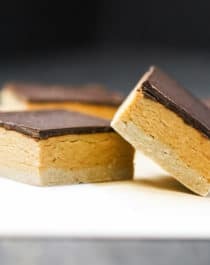 Any finally, for both the SHORTBREAD BASE and the PEANUT BUTTER FILLING, does it matte whether we use whey ISOLATE or CONCENTRATE? Thanks! I’m afraid those subs won’t work here (I tried reducing the honey which didn’t work, and the oat flour helps with a chewy fudgy texture). I haven’t used whey isolate here so I’m not sure… I think the concentrate should be just fine? From top to bottom these look perfect! This looks like another recipe that I have try!! Do you think that I can use Better’n Peanut Butter?